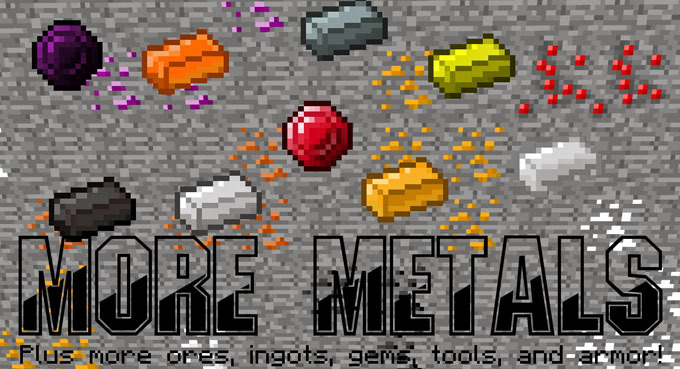 More Metal Mod includes numerous new metal blocks, ores, alloys, ingots, tools, and armor. By using two new gemstones, you can craft tools and armor from metal alloys which made from various metal ingots. New Ores: There are seven ores included in this mod: bronze, copper, silver, platinum, ruby, amethyst, and carbon. Each of these ores can be melted down to create ingots. Ruby and Amethyst ores will drop a gemstone when mined and these gemstones can then be used to craft armor and tools. Tools and Armor: Tools and armor are crafted using metal alloys and gemstones (Read more about metal alloys in the next paragraph). These tools and armor, with the exception of the swords, are still less valuable than full diamond armor. Many of the tools are more efficient, however none of the tools have more uses than diamond(1,562). There are four new types of tools and four new types of armor: ruby, amethyst, brass alloy, and aluminum alloy. Brass alloy is the weakest of them and ruby is the strongest. The armor requires only ingots or gems to create, however tools will need a combination of alloy ingots and alloy rods or gemstones and carbon rods.